Messier 78 is a reflection nebula in the constellation Orion. As the name “reflection nebula” implies, M78 shines by the reflection of light from surrounding stars. 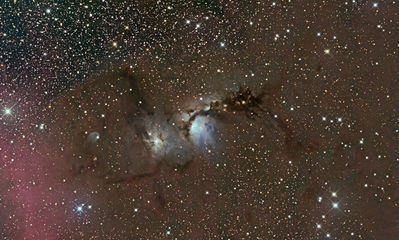 Long photographic exposures show the dust lanes that are near the nebula. The red area in the lower right hand corner of the photograph is part of Barnard’s loop.... a large loop of excited hydrogen gas. Total combined exposure of 11.5 hours (138 x 5 min lights, 35 darks, 64 flats, 64 flat darks); Takahashi E-180ED astrograph; Canon 40D modified.